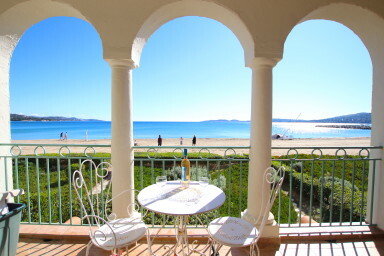 This large apartment is situated on the 1st floor of a building on the beach of Port Grimaud and has a beautiful view over the Gulf of Saint Tropez. It is composed of a nice living room with a loggia, a separate kitchen, 1 bedroom with a large bed on sea side, 2 bedrooms with two single beds in each, a bathroom and separate toilets. With a decoration both modern and provencal, this apartment will charm you! Balcony with a wonderful sea view and the beach in front of you. Parking on the main parking.